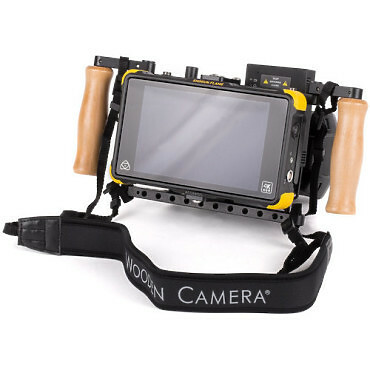 The Wooden Camera Director's Monitor Cage v2accepts virtually any 9" LCD on-camera monitor, allowing it to be securely held and carried by a director or anyone who needs to have a personal monitor during a shoot. Featuring wooden handgrips, a padded neck strap, and a swing-away design for easy access to the back, this cage makes carrying a small monitor both simple and comfortable. Based on a universal plate system that mounts your monitor using 1/4"-20 mounting points on the side, top, or bottom of your monitor. In addition to holding your monitor, the cage allows for the mounting of a separately available V-mount or Gold-mount plate for battery power, and it also leaves plenty of room for wireless equipment, so you can remain untethered on set. The Wooden handgrips fold for easy storage, while the included sunshade can be used as a protective cover. The included sunshade adapts to most monitors and attaches directly to the cage, so it does not interfere with your monitor's front panel controls. An optional adapter kit allows you to mount two Director's Cages v2 together.